Newly constructed home nestled in Colfax Meadows. This 5-bedroom, 5.5-bathroom farmhouse masterpiece offers open-concept living spaces, thoughtfully designed to showcase California's indoor-outdoor lifestyle. The fully equipped gourmet kitchen with island is the focal point of the home. 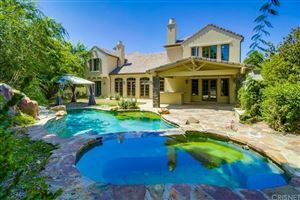 It opens to a fabulous family room with panoramic doors that integrate the space and onward to a sparkling pool with waterfall feature and spa. The lower level boasts a formal living room and din room, open-concept spaces with adjacent butler's pantry for convenient entertaining, and a private en-suite guest room. The 2nd floor offers an expansive master featuring vaulted 10-foot ceilings, luxurious appointments including a spacious master bath with soaker tub and shower for two, and a large custom-designed wardrobe. The brass fixtures, high-end materials, and finishes throughout are contemporary and luxurious. 3 fireplaces in total. Carpenter School District. Attention to detail is evident. Welcome!